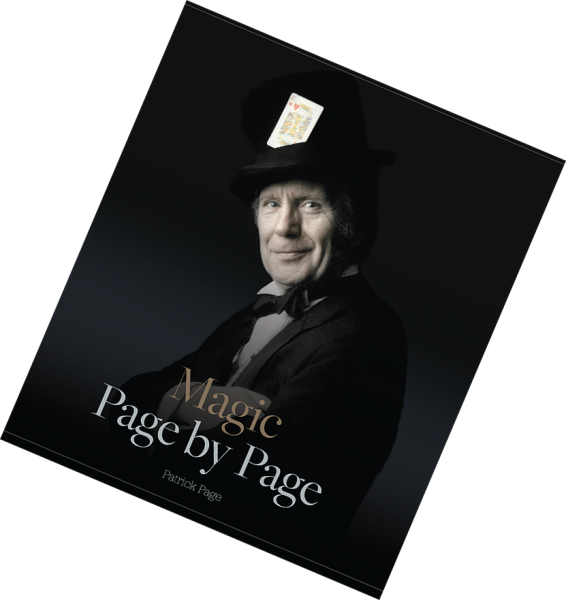 The 1st Edition Hardback version of Magic Page by Page by Patrick Page was published at the end of November 2011 and the 1,000 copies printed were sold out in May 2013. Thank you to everyone who bought the book and said such nice things about it. This is the 2nd edition softback version. Same print quality but with a soft cover and a few more photos. Lighter in weight to send by post. We have passed on the cost savings to you. Cost £55 inclusive of postage and packing to addresses in Continental Europe. The 1st Edition Hardback version of Magic Page by Page by Patrick Page was published at the end of November 2011 and the 1,000 copies printed were sold out in May 2013. Thank you to everyone who bought the book and said such nice things about it. The 2nd Edition has now been printed and is available to purchase exclusively from Patrick Page Magic. We took on board your comments about the weight of the book and the cost of shipping it to you and have created a softback version which is significantly lighter than the hardback version. All the costs of paper and printing have gone up since we printed the 1st Edition to make the 2nd Edition more expensive for us, we have reduced the price of the book to £40 sterling to keep the book affordable and it compares very favourably with other magic books published over the last 10 years. The soft back version is still a very big book, lavishly illustrated with 328 pages, 12″ x 9″ in size, jam packed with great magic effects and advice and advice on how to perform them from one of the magic’s greatest teachers. It contains details of the routines that Patrick regularly performed and from which he earned a living over the last 60 years. We have used the same quality paper as before and just replaced the hard cover with a soft cover to get the weight of the book down. We have passed on those savings in postage / shipping to you. What is different about the new 2nd Edition version? • We added a few people to the list of people whose help with the book we wished to acknowledge and who weren’t included in the first edition. That’s it. We haven’t changed any of the words. It is exactly as Patrick wrote it. We would have risked being struck down by a bolt of lightning had we dared! What’s in the book? Well what isn’t in it? Well there are chapters on cards, stacked decks, coins, the Miser’s Dream and palming, use of sponge balls, ropes, thumb tips, paper tearing and restoring, silks, purse frame etc., dealer delights such as Cord A Cup, Easy Money, Patrick’s version of the 3 Card Monte, Money Bag, Old Moore’s Diary, the Hanky Panky Cloth, the Topit Vanisher, Comedy Magic, Misdirection, Spectator assistance and much much more. Below is a non exhaustive list of some of the money topics covered by Patrick in his book. Cards to Pocket – Patrick’s own take on a classic piece of card magic. The Continuous Do As I Do – an effect performed by Patrick over many years starting off as a quickie, close-up card trick to its eventual handling, featuring entertaining audience participation. An Impromptu Vanish – the ideal effect for anyone who already performs card manupulations. Beyond Coincidence – “strolling magic” which requires no preparation, just a deck of cards. Patrick Page’s Card in Wallet – a spectator takes a card from a pack of cards, marks it with initials and the card is revealed from a zipped wallet. One, Two, Three, It’s Yours – an unexpected method of producing a previously selected card from a pack of cards. Heba Haba Magic – Patrick Page’s version of what was his favourite trick. The Davenport Deception – a visual effect involving a card under a coin changing to a selected card. The PrincESP Card Trick – a variation of the Hardin Princess Card Trick, with E,S,P cards. Three Cards Across – a classic card effect involving 3 cards travelling from one pack to another. Princess Quatro – based on the Hardin Princess Card Trick with a climax which is more surprising than the original. Peg It – producing a selected card and clipping it between the jaws of a clothes peg. Jumbo One in the Middle – a modern version of an effect devised by Patrick Page in the 1950’s, with Jumbo cards. Big Money Aces – a card trick with a surprise finish. The Top Change – how to perform the top change with a pack of cards. The Unknown Soldier’s Card Trick – a card trick based on an idea given to Patrick Page by Ken de Courcy (and shown to him by an American soldier in North Africa during the 2nd World War). The Multiple Colour Change – Patrick Page’s interpretation of the famous Dai Vernon Tenkai Palm colour change. The Pageboy Card Switch – a move enabling you to switch one card for another while the card is lying down on the table face down. The Ultimate Variation: Old Moore’s Diary – Patrick Page’s own diary trick. The Four Packets – Parts 1 and 2. The Chanin Coin Production and Variation on the Chanin Theme. Chapter 5 Miscellaneous: Sponge Balls, Ropes, Silks etc. Easy Money – turning paper into money. Patrick Page’s most well known trick but one that many do not realise that he was the inventor. Double Mirage – Parts 1 and 2. Full instructions and tips on how to use the Topit Vanisher. Patrick included the Topit Vanisher in all of his routines. Information on more comedy gags and effects than you will ever need but almost certainly something to suit everyone in this Chapter. Below is a list of topics included in this Chapter. Effects concerned with a spectator assisting the performer. Appendix – Interview of Patrick Page by Matt Field, editor in April 2007 for The Magic Circular, the monthly magazine of The Magic Circle. The book has been described as “a career changing book”. Full of wit and wisdom, Magic Page by Page is Patrick’s life’s work in magic, a virtual omnibus of his magic inventions, written down for posterity. Thanks to Matt Field and Michael Albright (editor and designer respectively), it’s also a stylish, elegant book that’s easy to read. Published by the family (at Patrick’s request), the price for sales in Continental Europe inclusive of shipping / postage and packing is £55. Please make payment by Paypal. We will try to ship to you the next working day. To keep the cost of sending the book to you to a minimum, we post to Continental Europe by air mail (printed paper rate). We are grateful to Dave Goulding who has just written (5th December 2011) the following review of the book for the Aberdeen Magical Society’s in-house magazine Pisces and given us permission to use it. We have also included a review received from Pat Fallon in Dublin (9th December 2011). Thanks Pat for generously allowing us to include it below for your enjoyment. subjective review of this book. lovely line drawings and even publicity-type photos of Pat. It is beautiful to look at. magic is covered from cards and coins through to stage via strolling, parlour and restaurants. generous gesture by the publishers! I really don’t want to think that this will be the last ever Pat Page book. * Unfortunately since this review was printed, the Post Office has increased its postal charges and we have had to increase the price of the book to £55 in the UK to reflect this. It is a heavy book weighing just under 2 kilos. Note from Patrick Page Magic – the price for delivery to the Rest of Europe is £63 inc P&P. Review from Pat Fallon in Dublin (9th December). Thanks Pat for allowing us to including this review. This morning I felt very sorry for my postman as I saw him heading to my front door in the wind and rain with as rather large package under his arm. Despite feeling sorry for him I was happy to see him struggling, as I knew he was delivering my much anticipated copy of Page by Page. Nothing could have prepared me for what was inside the brown cardboard packing, not even the preview material I had seen at the International Convention a couple of weeks ago. It is a magnificent large format volume of some three hundred and twenty seven pages, full of Patrick Page’s routines, stories, observations, tips, advice and photographs, all beautifully laid out in a way that makes it a joy to read. The design work by Michael Albright is just wonderful and you could not ask for a better editor than Matthew Field which makes this a truly beautiful piece of work and everything the author would have expected it to be. It is a fitting tribute to a man who did so much to further the careers of so many of the magicians like myself currently working all over the world. Anybody who has witnessed Patrick Page in action would know what to expect in the way of tricks and routines, but it’s all the other extra stuff you get that makes this such and enjoyable and educational read. This book was a gift to myself to be read over the Christmas Holiday, but I could not resist delving into it to savour some of the contents and these are just two of the many gems I discovered. Chapter Two dealing with the stacked asks the question “A spectator takes a card and you immediately know it’s name, now what. They name a card and you instantly know it’s position in the deck, now what. They call out a number and you can tell then what card is at that position, now what” not only does Patrick Page ask the question, but thankfully he gives you the answers. Chapter Ten is entitled ‘Now they see it’ which is probably the most comprehensive collection of tricks where everybody, but the spectator on stage, knows what is happening except him. Tricks like the Paper Balls over the Head and Card on Forehead are just two of the many items dealt with in this chapter which was for me alone worth the asking price. I was very lucky to have personally known Pat and any time spent with him was always a joy. It was his other ‘Big Book of Magic’ the really got me started, which he always maintained was regrettable, that he had to bear the burden of responsibility for me inflicting pain on the general public. I do have two major regrets about the book, one being that Patrick never lived to see his masterpiece published and the other is that unlike all the other Patrick Page material in my library it will never bear his signature. You may be gone but this book will ensure you are never forgotten.